Surrey Ridge resident George Botsonis is dedicated to serving the freshest food possible at his Heidi’s franchise in Lone Tree. he family went for it and purchased the franchise. Since then, Botsonis has done quite a good business at a job that he loves, and he even made a few custom changes to his franchise not found in other Heidi’s. Botsonis introduced an iced tea bar to his restaurant with nine flavors including sweetened and unsweetened tea. He also added 25 to 30 soup recipes to their repertoire. The restaurant serves 8 to 12 soups at a time during cooler weather and 6 to 8 during the summer months, including some cold soups. His recipes include vegan, vegetarian, and gluten free options as well. Botsonis’ wife, Kerri, who works full-time in the pharmaceutical industry, helped her husband out with a couple of family soup recipes, including her grandmother’s chicken noodle soup and her sister’s cheesy chicken tortilla soup, which are the two most popular on the menu. Kerri has also researched other soup options on the weekends and has come up with some great creations such as their gluten free lobster bisque in white wine sauce made with real lobster. Botsonis, after receiving a request from some customers, now offers a soup sampler which allows customers to try three different soups for only $4.99. All soups are made from scratch with the absolute freshest vegetables and ingredients. All soups are low sodium as well. Botsonis didn’t stop there; he continued his all fresh, all the time theory with the restaurant’s coleslaw and cannoli, which are all made fresh daily and completely from scratch. And as with all Heidi’s restaurants, the sandwich breads are made fresh every day with no preservatives whatsoever. Day-old bread is sold for $1 per loaf, and Botsonis donates a portion of the profits to a local homeless shelter. 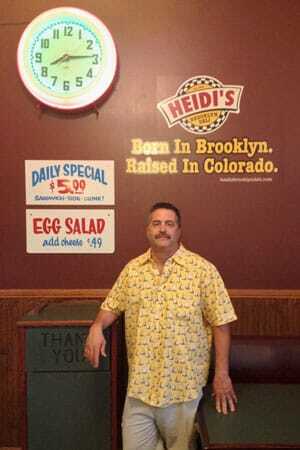 Heidi’s is located at 9630 Heritage Hills Circle in Lone Tree. To learn more contact Botsonis by e-mail botsonis@gmail.com or call 303-792-3037.